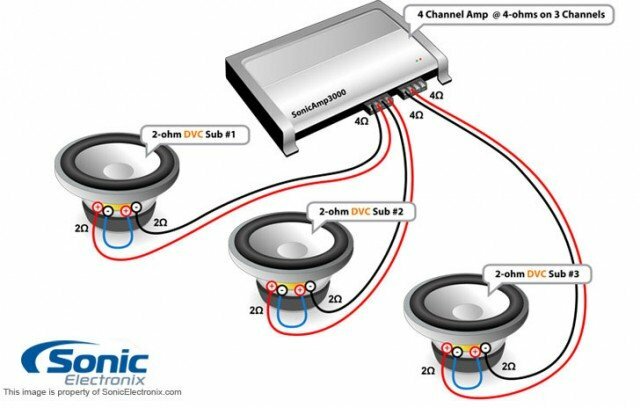 Two of the most important specifications to look at when matching subs to an amplifier are impedance and RMS rating. The total combined RMS rating of all the subwoofers should not exceed the power the amplifier produces at the impedance that your subwoofer draw. Remember, ohms measure resistance. The lower the ohm rating, the lower the resistance. The lower the resistance, the higher the power flow from the amplifier. Here is an example that will help illustrate how to figure out possible wiring combinations. For our example, we will use a Kicker ZX750.1 monoblock amplifier. Despite the monoblock designation, a monoblock amplifier can power more than one subwoofer. In fact, monoblock amps usually produce greater amounts of power than multi-channel amps, which makes them ideal for powering car subwoofers. Since we know that this amp can provide power up to 750 watts of RMS at 2 ohms, we should use a subwoofer combination that requires less than 750 watts. Add the RMS ratings of each subwoofer together and make sure it is less than 750 watts. Most manufacturers recommend slightly overpowering your subwoofers. Contrary to popular belief, underpowering your subwoofers can lead to blown or damaged cones. Of course, this refers to RMS ratings, so be sure that you do not exceed peak power ratings. I have included a table below to help you learn how to match subwoofers with amplifiers. This is not a comprehensive guide to wiring but it does contain some good guidelines.